[unpad.ac.id, 01/1/2018] Unpad won the second best information service thgrough website category of the the 2018 Public Relations Award held by the Indonesian Ministry of Research, Technology and Higher Education (Kemenristekdikti). The award was received directly by Unpad Rector Prof. Tri Hanggono Achmad on the sidelines of the 2019 Kemenristekdikti National Work Meeting at the Diponegoro University campus, Semarang, Thursday (1/3). On this occasion, the Rector was accompanied by the Director of Governance and Public Communication Aulia Iskandarsyah, M.Psi., M.Sc., Ph.D. The Public Relations Award is the second time held by Kemenristekdikti and has three categories namely the quality of information services through the internet (website), social media, and media relations. In addition to giving the Public Relations Award, Kemenristekdikti also gave a Lapor! Award as an appreciation for the performance of Public Relations and administrators of Lapor!. Award of Public Relations and Lapor! followed by a number of state universities and Higher Education Service Institutions (LLDikti). For state universities group, this award is divided into several categories, namely Legal Entity State University, Public Service Agency/Working Unit, New State University and Polytechnic. Secretary-General of the Ministry of Research, Technology and Higher Education Prof. Ainun Na’im said that this awarding is expected to encourage public relations staff of state universities and LLDikti to work more creatively. “The selected sate universities and LLDikti can motivate other public relations officers to do better,” said Prof. Ainun in a press release received by the Unpad Public Communication Office. The Rector also appreciated the award. He explained, the Kemenristekdikti appreciated Unpad’s public communication performance especially on the aspects of website development and management. 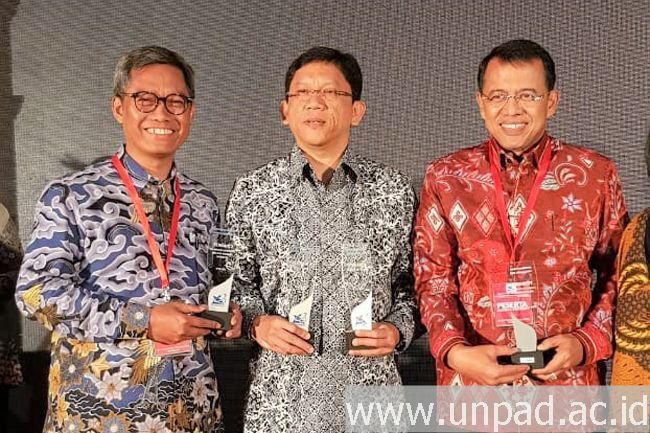 “This award shows the spirit of Unpad accountability and information disclosure by further application of information and communication technology in the digital era,” said the Rector. For this reason, the Rector encouraged all Unpad staffs to master various advances in information and communication technology in their campus activities as well as to communicate more actively with various positive information about Unpad.